Coconut Palace Manila the Marcos's Presidential guesthouse. Coconut Palace Manila, come and judge for yourself! the Coconut Palace Manila was built for Pope John Paul's 1981 visit, but he refused to set foot in the Palace, do you know why? During the Marcos regime, excess was the order of the day. Nothing was too big or expensive or too opulent. Money was not an issue either, irrespective of what was happening to his people and country, life for the elite was getting better and better and better and then came the Coconut Palace Manila. So in 1978 at a then cost of P37,000,000 or at the time US$10,000,000 the Coconut Palace in Manila was built. The Coconut Palace was the Presidential Guest House of the Marcos's and was built by Imelda Marcos, the same one who has the shoe fetish. The Coconut Palace is built on Manila Bay with extensive bay views, I shudder to guess what the land alone would be worth now! Coconut Palace Manila - What is the "Coconut" all about? The Coconut Palace Manila is named because the structure is made of nearly 70% chemically treated coconut lumber. Most of the materials in the Palace are native materials from the Capiz shells to the Jusi fibres. All of the components of the coconut tree have been used in the creation of the Coconut Palace. The Coconut Palace is located in the Cultural Center of the Philippines on the corner of F. Ma. Guerrero and Vicente Sotto Sts, Manila. 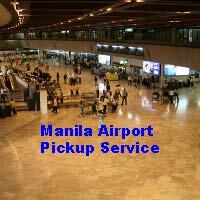 It is open from Tuesdays to Sundays from 9:00 am to 4:30 pm. However I found these times to be a bit casual, I arrived on a Tuesday afternoon at 4:00pm to be told by the guards on the gate that viewing was over for the day. Just smile and come back tomorrow. On arrival, you should note that you cannot drive into the grounds, there is a big gate at the front, which is manned by security guards, you will need to park on the road, there is plenty of parking around. So you walk up to the gate and ask the security if you can visit the Coconut Palace. They will either send you away or let you through. Once through the gates, you will first notice how beautiful the grounds and landscaping is. The actual Palace itself is designed to the traditional Filipino salakot or hat shape. As you follow the driveway to the main entrance you will be confronted with a desk and more security guards. This is where you will pay your entrance fee of P100 and be assigned an official tour guide, my guide Joy was fantastic who had a wealth of knowledge and a sense of humour. They are very strict about photographs, not entirely sure why, but upstairs is a no go for photos, you either turn your camera off and put it in your bag or you will have to leave it downstairs with security, I suggest you turn it off and put it in your bag. If you do try to take photos upstairs your guide may lose therejob, so please abide by the rules. They average about 50 tourists a day. Downstairs is the Dining Room with seating capacity for 24 people, you can see from the photo above that the table is of high quality. The Library is also downstairs as is Marcos's Study. This is the first room and was actor George Hamilton's favourite. He was also the favourite actor of Imelda Marcos. There are a few rumours in relation to the two of them, which are probably best left alone. Take special notice of the overlaying sheet on the bed. It is made of Jusi Fibre or fibre from the banana tree. This room represents Muslim Mindanao and is adorned in the colours purple and green which is there official colours. This was Imelda Marcos's favourite room, little wonder why as it faces Manila Bay. Her room was separate to her husbands for security reasons. Take note the beautifully hexagonal shaped table, truly quite amazing. Also to note is that the Hexagon is the favourite shape of the Marcos. Filled with traditional Ifugao tribal artefacts, this room is a historical treasure, if only I could have taken some photos! Same sort of set up as the others, however this was Brooke Shields favourite room. 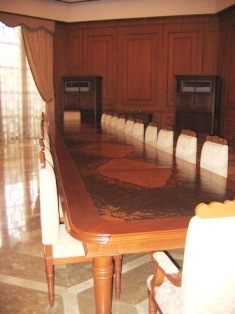 The Pangasinan Room was Mr Marcos room. It probably has the largest bathroom I have ever seen! A notable feature of this room is the bedspread. Made of Pineapple fibres or Pina fibres, quite remarkable. The Coconut Palace faces Manila Bay and has a gorgeous swimming pool that the palace itself wraps around. A huge grassed area sits between the swimming pool and Manila Bay, which is now used for weddings and parties. Whilst I was there they were preparing for a wedding, setting out tables and chairs. Guests however do not stay overnight, they are just allowed to use the facilities. 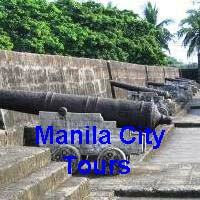 For other Manila attractions have a look here. Why did Pope John Paul refuse to see the Coconut Palace? Well it seems that the Marcos's misjudged the Pope. Hoping that he would stay in a magnificent setting, such as the Coconut Palace, the Marcos's were snubbed. I wonder how they took that? Anyway the pope decided that the Coconut Palace Manlia, was way to pretentious and flamboyant and so declined the offer to stay. Would have loved to have been a fly on the wall during that conversation. If you want to see some more photos of Coconut Palace Manila, have a look here.